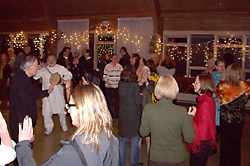 The Awakening Heart Circle, an Inayati Order centre in Toronto, hosts an annual New Year's Eve celebration. The event features a pot-luck dinner, Universal Worship service, Dances of Universal Peace, and Sufi zikr ceremony (the remembrance of God). Please join us for this special evening. 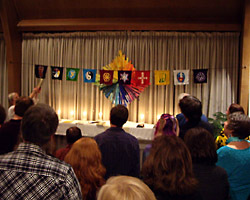 Universal Worship – Candles are lit symbolically representing many of the world’s religious traditions. We celebrate each religion through dances and chants that represent and honour each tradition. Dances of Universal Peace – A joyous, multi-cultural way to touch the spiritual essence within ourselves and others. Sacred phrases, chants, music, and movements from many traditions of the world are used to promote peace and integration. There are no performers or audience, the dances are simple and easy, and no experience is required. Parking: There is a small parking lot behind the building off Ashdale Rd. Street parking is available and public parking lots are nearby. TTC: A streetcar (506 Carlton) runs on Gerrard Street East. A bus (22 Coxwell) runs from to the Bloor-Danforth subway line at the Coxwell station down to the Lower Gerrard East stop. Please... No alcohol. No nuts in food. Fragrance-free. If you bring children please be sure to supervise them. We have some photos online from the 2008, 2009, 2010, 2011 and 2012 New Year's events. That person becomes conqueror of life who learns to control his tongue.